Chart No. 10 Boston Bay and Approaches. 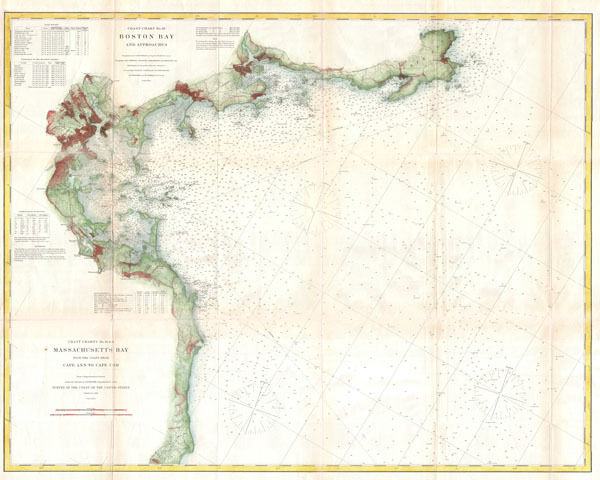 A rare 1866 costal chart of Boston Bay, Boston Harbor, and environs. Covers the Massachusetts coastline from Cape Ann southward past Gloucester, Marblehead, Lynn, Boston and Cohasset to Green Harbor River. Offers astounding inland detail noting individual buildings, roads, communities, fields, and smaller waterways. In addition to inland details, this chart contains a wealth of practical information for the mariner from countless depth soundings, sailing instructions, tidal information, lighthouse locations, and notes on magnetic variance. The triangulation for this chart was prepared by C. O. Boutelle and Capt. T. J. Cram. The topography by H. L. Whiting, G. B. Gluck, A. M Harrison and R.M Bache. The hydrography was accomplished by a team under the command of C. H. Davis, C H. Mc. Blair, C. R. P. Rodgers, W. G. Temple and H.S. Stellwagen. The entire production was supervised by A. D. Bache, Superintendent of the Survey of the Coast of the United States from 1843 to 1865. Report of the Superintendant of the U.S. Coast Survey, (1866 edition). Very good condition. Some wear, verso repairs, and toning on original fold lines. Else clean.